There’s a nightmare scenario for every parent. We all have them. That phone call we fear….. arrested, suspended, drinking and driving, etc. That revelation we fear…. addicted, sexually active, gay, etc. That action we fear…. tattoo, running away, getting high, bullying, etc. That diagnosis we fear…. std, pregnancy, etc. 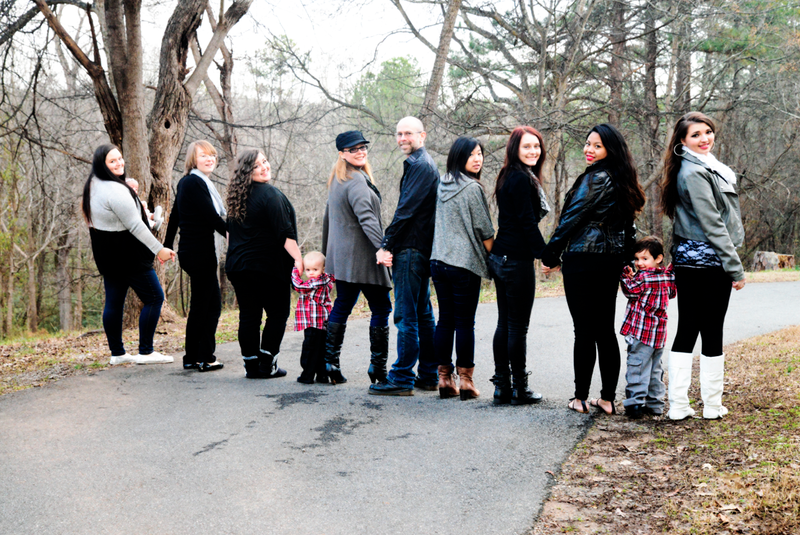 Have you ever considered what you would do if the worst-case scenario occurred in your family? If you haven’t, you should. And, if you’re already facing any of these crises, there’s hope. Trust me. As a mom of seven young adult daughters, I have ridden the crisis parenting wagon on more occasions than I would like to admit. Every single time the hammer falls, it’s terrifying. Every single time the hammer falls, it’s heartbreaking. 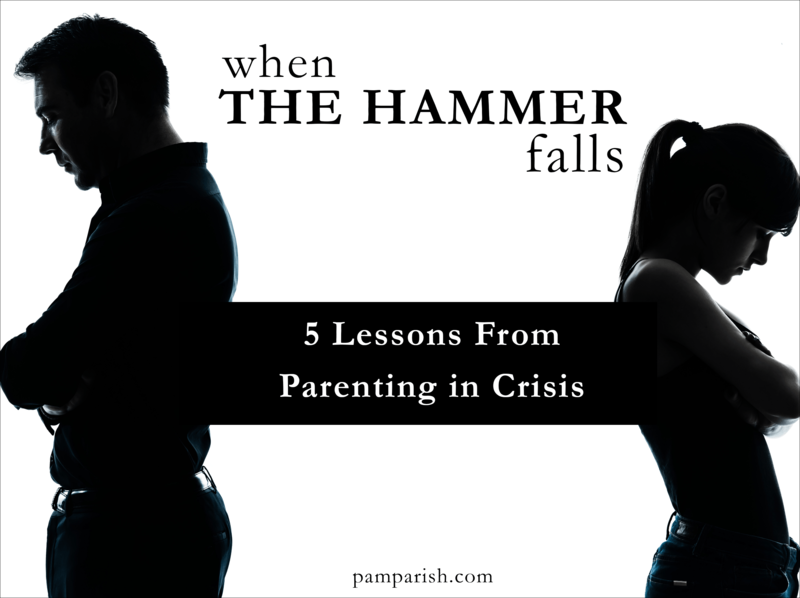 Every single time the hammer falls, it’s an opportunity to parent well. In the center of a crisis moment, it’s easy to lose sight of the bigger picture of parenting and give way to our deepest fears, hurts and our own self pity. I know, I’ve done it on too many occasions. It doesn’t work. Losing control of ourselves in the midst of crisis is not only unhelpful, it’s damaging to your relationship with your child. If we aren’t careful, out of our own anger and hurt, we can push our children toward even worse situations and away from us – their place of safety. 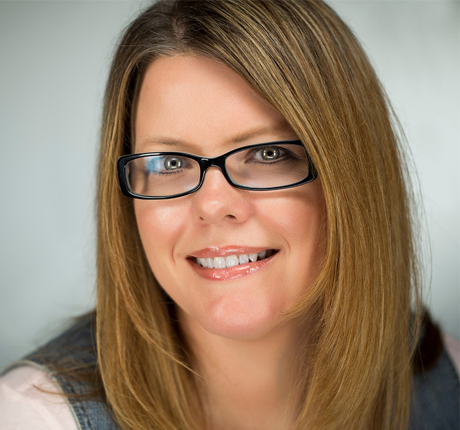 Here are five lessons that I’ve learned from parenting in crisis. Drama doesn’t solve problems, it creates them. In any situation, you can only control your own emotions and actions, not those of the other person. Take control of yourself. Yelling, accusing, giving guilt trips and lecturing don’t help. If you need to take a moment to gain control, do it. Being able to calmly listen to your child in the midst of a crisis communicates safety and trust. Calmly responding communicates that you are in control of yourself and can be trusted with the information that they are sharing. The biggest fear that our children have is that we are going to “freak out” when we find out. Don’t. If they can trust you with their “worst,” you are the safest place for them to go in the whole world. My husband and I have a saying, “Never give someone the bat to hit you with.” It’s a simple phrase that means, if you tell someone how to hurt you, at some point – in anger, in spite – they’ll use it. The same is true for absolutes, when you lay them out there you have no wiggle room when your kid calls your bluff. And, let’s be honest, most absolutes are bluffs – fear tactics used to yank our unruly child into shape. “If you do that one more time….,” “Next time……,” “In the future, we’ll……” It doesn’t work. Just stop it. Rather than using absolutes, lay out the types of consequences that your child may face if his action repeats itself. Calmly. In relationships, nothing is static. Relationships change, situations change, our thinking changes. Never lock yourself into something that’s hard to back away from later. In any conflict, but most especially in crisis conflict, we cannot trust our own emotions. Emotions betray you. Hurt, anger and grief cause us to act and react differently than we would under normal circumstances. An outside opinion is always more trustworthy than our own in the midst of crisis. Build a support base of friends who know you, know your family and understand raising children through difficult times. You’re going to need them. Once in crisis, use them as your sounding board for everything – issuing consequences, handling conversation, seeking help and listening to you cry. Bouncing your emotions, thoughts and plans off of someone who’s not directly impacted by the crisis will save your relationship with your child, restore your emotions and bring you peace. Our natural response in crisis is to close ourselves off from others; don’t give into that desire. You will come out of the crisis much faster with others by your side. Relationship trumps “lesson” – every time. Our ongoing relationship with our children is worth fighting for and must remain front and center in our parenting at all times. Too many times, we lose sight of the relationship in an effort to teach a “lesson.” When the lesson trumps the relationship, you’re parenting off center. I’m not saying don’t issue consequences, discuss hard things or discipline your children. Do those things from the perspective of relationship – reinforcing your role in their life, your love for them and your belief in their ability to overcome in the midst of the crisis. Hearing someone tell you that they are committed to you and love you, even when you know you’ve done something terrible, is one of the most edifying and encouraging things anyone can hear. Allow your children to see that you value relationship with them, even when they’ve messed up big. No matter how much we want to, we cannot save our children from themselves. And to do so could cripple them from life lessons that they seriously need to learn. Natural consequences – failing the test, losing the friend, getting arrested, losing the job – are the best teachers. There’s nothing we can teach our kids that will trump the pain of a consequence that they can blame on no one but themselves. Logical consequences – paying for the damages, owning up to their mistakes to someone else, living without something that’s been damaged – are things that we all have to learn at some point in life. 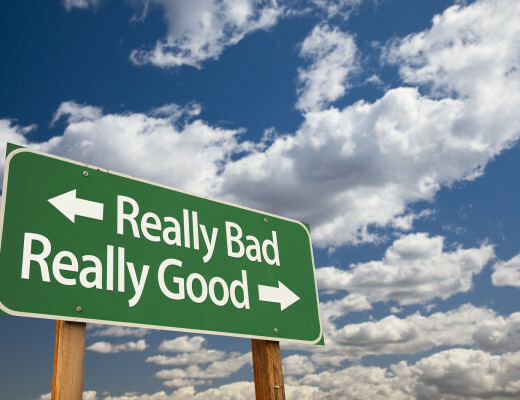 Every action – good or bad – has equal and opposite consequences. Don’t stand in the way of your children learning those lessons. We must always remember that we are neither our child’s prosecutor or rescuer. To be either removes us from the most important role, mom or dad. 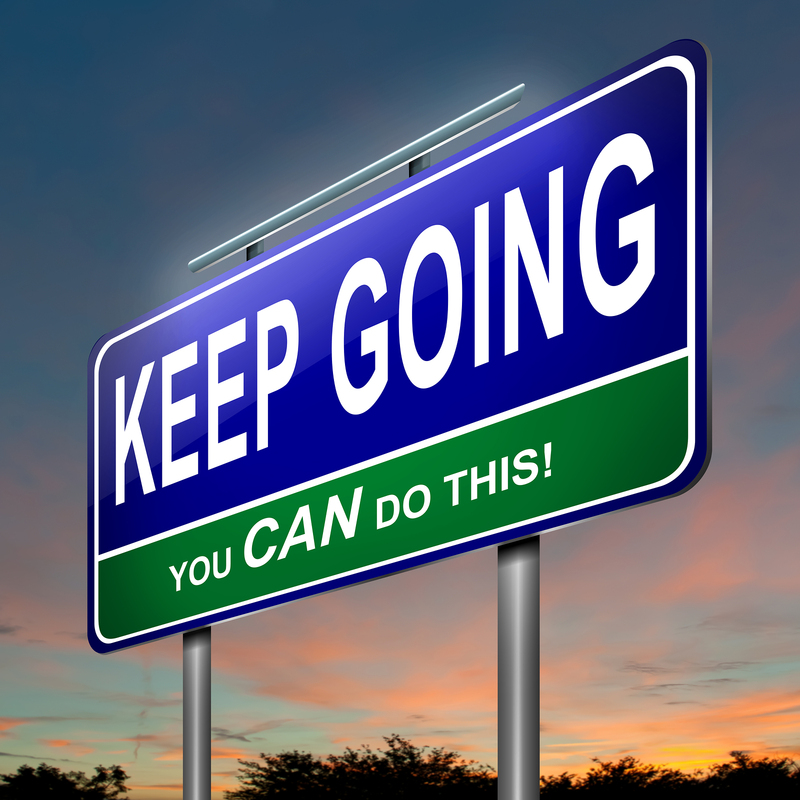 Keep Going: You CAN Do This. This is an amazing post with so many helpful reminders. Thanks so much for sharing!